Do you get a lot of emails that require follow-up or an action to be performed? If so keeping track of them and remembering when to do them can be difficult. I am going to show you a killer way to easily create a task in Microsoft Outlook to remind you to take care of it. 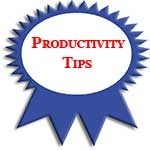 This productivity tip will show you how to easily covert a Microsoft Outlook email into a task with a reminder so you will never need to worry about a follow-up or an action item email. When you receive an email that has an action item related to it such as you need to follow-up on it or that it requires a task to be done you can easily create a reminder in Microsoft Outlook by converting the email into a task. It is easy to create a task from an email in Microsoft Outlook. From your Inbox pane highlight the email you want to create a task for. The email does not need to be open. With the email highlighted drag your mouse down and drop it on the Outlook Tasks bar. Outlook with take your email and convert it into a task. It will copy the content of the email into the body of the task so you have all the information you need in the task. The subject of the task is taken from the subject line of the email, but you can easily change this to something more meaningful in your tasks list. Like any Outlook task you can set a due date and a reminder. Set the Due date and click the Reminder check box to set when you want to be reminded about this task. Now all you have to do is click Save and Close on the task. No worries about remembering to take care of the task you received in the email. Outlook will remind you of it. At this time you can either leave the email in your inbox, move it to an archive or action folder or even delete the email since the entire content of the email was copied into the task. Learn more ways to take control of your email by reading “Use a 5S System For Your Email”. We do not always have the time to follow-up or take action when we receive an email. The action may be required in the future making it difficult to remember. By converting the email into an Outlook task with a reminder you will be alerted that you have to perform a follow-up or action. This works with most versions of Microsoft Outlook and is very easy to do. Below is a video that shows you how to do this task. Thanks! I always used the “Flag for follow up” option but this doesn’t work 100% with synchronised task lists because although it shows as a “task” in Outlook, it isn’t really a task therefore doesn’t get copied across during sync. I tried this and it works well. Great tip. Been using Outlook since the 90s and never knew about this. The only reason I came across it was that I recently got a Blackberry at work and wondered why email’s marked for follow up didn’t display in the tasks list. It now makes 100% perfect sense. Word of caution, I have seen it where if you Delete the Task instead of Removing it from the task list, the original email get sent to the Deleted Folder. If you are tracking high priority email as tasks, say from your boss, be careful that you are Removing the follow tasks, vs. Deleting the tasks. In my case it turned out the original email was being deleted as well and I lost my communication audit trail. The only problem I have experienced doing this is when the email has an attachment. In the instances that I have dragged the email (with attachment) to the Task bar, the attachment is lost. So for emails that have attachments, I place in the Follow Up folder. Emails with no attachments, Task bar. By the way, I am using Outlook 2007, not sure how 2010 handles this. I notice when dragging an email with a table of data, the table formatting is lost after dragging the email to task. Is there any other workaround or solution to this? I have used this functionality for years. Effective and simple. However, I do add my opinion to the considerations regarding the email. It may not be wise to delete it. It must be brought down to the examples themselves. In Outlook, emails can be flagged in assorted manners in order that they pop up as reminders at a given date/time, with follow-up features, etc. When an email is flagged as pending, it will appear in the Task List view, this is if you click on the Tasks icon; this view is similar to a message center, where all the pending activities can be enlisted. However, such a view is not the tasks itself. If you open the menus view in Outlook and navigate to the Tasks folder, then you can see the tasks in a pure view. I find it convenient to flag emails so that they appear in the Task lists view, however I do have to remember that such view doesn’t make tasks out of emails, so if I need this list elsewhere, then I have to create the task from the email. I sync my data to mobile devices, and this will only admit tasks that are tasks, not emails flagged as tasks. What if you DON’T want the email to be a task? Somehow I managed to make a subscription a task, and I get a lot of them. I skim the subject matter, but it doesn’t delete the task so I wind up with more than a hundred emails as tasks after I delete the email. I love this feature, however, is there a way to indentify if an e-mail was converted into a task. This would help, because I sometimes forget if I had made a task from the email. In other words, once the email is dragged over and made into a task, is there a way of setting it up so it is obvious that the task conversion was done.